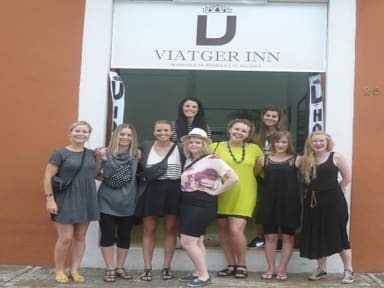 The hostel is situated directly in the center city, the beds are comfortable and we enjoyed the offer of eggs, milk, fruits and cereals for breakfast! Definately recommendable!! Super nice and clean hostel. Staff is friendly and has a lots of advices what to do. Das viatger in hat uns gut gefallen! saubere zimmer/badezimmer. wer jedoch ein partyhostel sucht ist an der falschen adresse:) es hat aber eine sehr gemütleche athmosphäre und ist perfekt zum ausspannen! 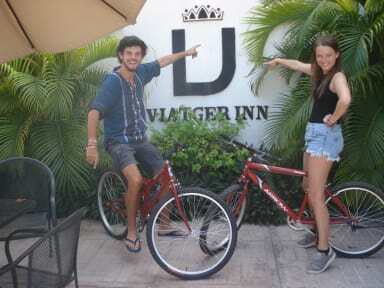 Gutes Hostel in weniger touristischem Campeche. Daher war die Atmosphäre nicht Hostellike. Empfehlenswert für 1,2 Nächte. Stayed at Viatger Inn for three nights. Staff is very friendly and helpful. The kitchen is okay. The hostel is more functional than cozy or inviting. And the mattresses in the female dorm are very saggy. I couldn’t really sleep well there. clean but no atmosphere:( also its expensive and you have to do your breakfast on yourself. the people who are working there are really friendly and help you with everything. location is middle in the city center.